i have recently been interested in buying a pistol. im looking for a dependable, safe semi auto. i like the Glock config for the most part so i talked to a friend who has both Glock and this pistol. 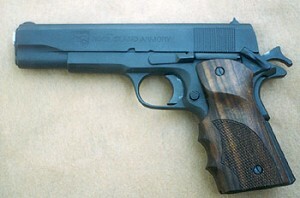 a Taurus Model 24/7 in .40 Cal. i have hunted with riffles when i was a young buck, but i find im not comfortable around pistols, even though i am greatly interested in them. so i plan on taking a class when i get one. i wont have a lot of cash. this seems like a dependable alternative.. the only flaw ive found online is if you have the trigger slightly depressed while engaging the safety, it will still fire after the safety lever is up. i dont think this will be a major concern, i cant imagine having your finger on the trigger unless your ready to fire. let alone, doing it while engaging the safety. 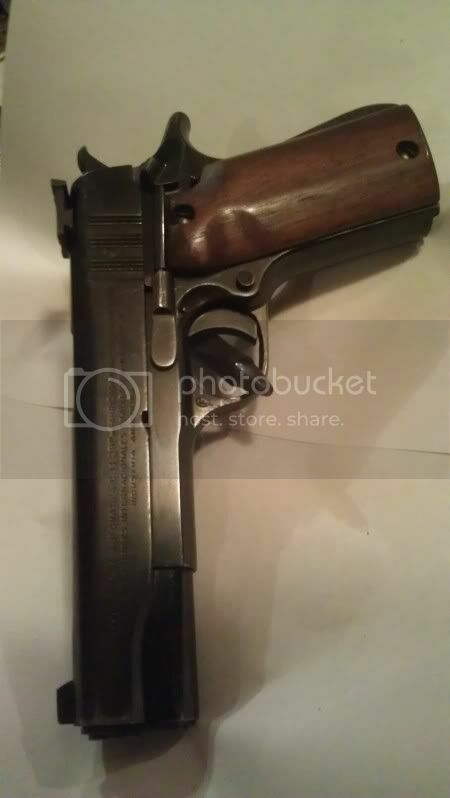 im wondering what you fine gun folk here think about this pistol. if you have heard of it, fired it, or own one. i would go with something smaller, but i dont think i can afford a gun hoard and work up to it. so in some ways i am looking at jumping in with both feet on this one. this pistol seems recommended by my gun friends here in Oregon. keep in mind. im only looking at spending around 500. after classes, ammo, etc. it will be about all i can afford to spend. any thoughts, info, or recommendations are greatly appreciated. oh please be nice to the gun noob ( me ) while ive always been interested in them, the only thing ive ever used is riffles and those where just .22 cal plinkers and hunting riffles. and most of those were old ranch style riffles lol. ( marlin 3030 and a JC higgins 22 riffle ) so expect a high ignorance level. but im more then willing to read up on stuff and do some research. so if you have some links or something im willing to look. like i said online last night - if the Taurus has that issue drop it from your list. the last thing you need is something potentially unsafe. glocks are fine pistols, you might be abe to find a used gen 3 for a decent price. if you can get or deal with something with a 5" barrel you should consider 9mm. the extra barrel length pushes the bullet faster and you get pretty much the same thing as a .40, without the snap. this can be even more important if you are just learning to shoot a pistol. plus the bullets are a lot cheaper. i think you should select your caliber first them look at the pistol. why not .45? if you can afford it Sig's are nice - pretty much any of them. we bought my wife a Ruger SR9C, you might consider a SR9. i am not partial to them at all, but a lot of people like Springfield XD's. One that is very high on my list is the Smith and Wesson M&P (Pro). hope that helps. maybe Buff will come along with some advice too. welp i went and got a pistol. i have been studying guns for a few weeks now.. i am totally fascinated. i think im now a firearm junkie! i find myself drawn to Firearms with history for the most part. i was originally planning on just getting one pistol this year.. however, i think 2 are in order.. ahem.. yea.. lol. ok so on to the pistol. 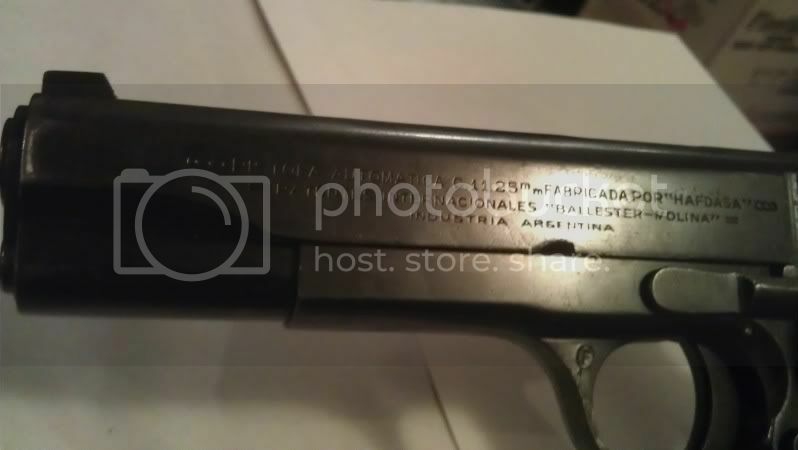 it is made in Argentina. 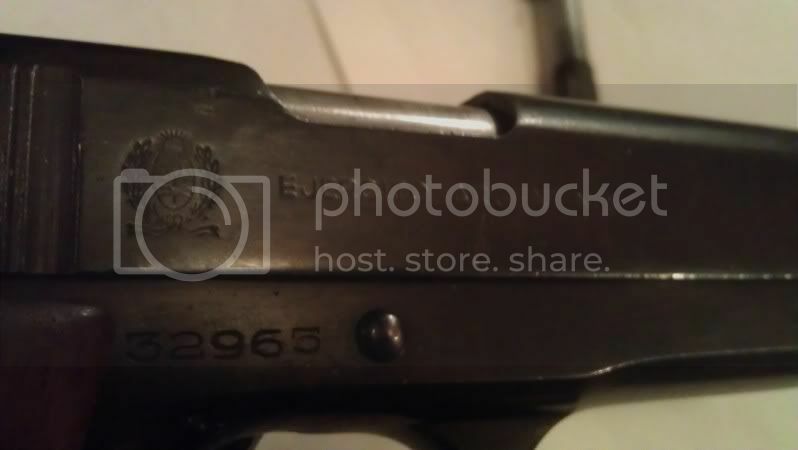 23,000 - 108,000 1944 - 1953 "
i love the history behind the pistol. for some reason i am the family historian, i do genealogy as well. the genealogy seems to be what triggered my interest in history. to me now, history makes sense. i often wounder what relative was where, doing what during important time periods. 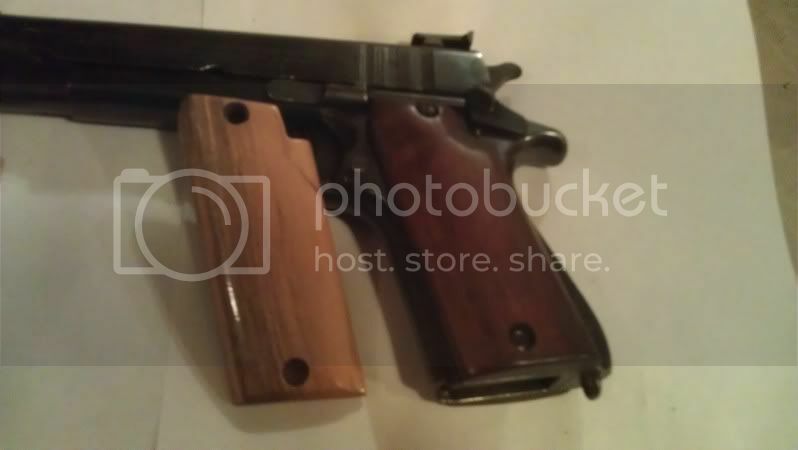 and to be honest, i find its a blast..
here are a few photos of the pistol i purchased. i can say that it does take the stock 1911 magazines. in fact. 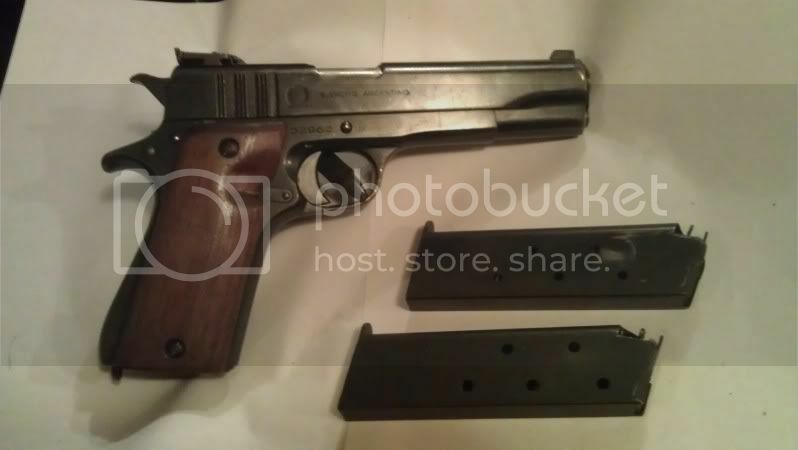 one of the ones that came with the gun is a colt 45 clip. 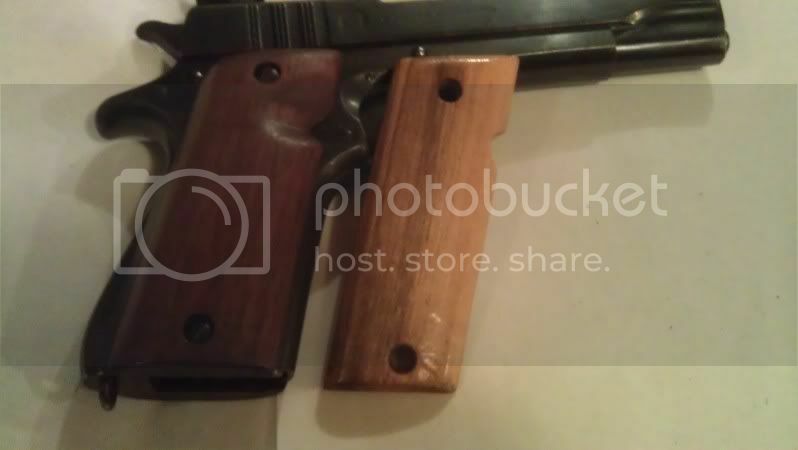 if you note, the light colored grips, they were what was on the pistol. they are not originals, but they are shaped the same as the originals just lacking the vertical grooves. the ones you see currently are grips i made today. you may note, there are depressions on the ones i made. this seems to help guide my fingers to the important parts such as trigger, magazine eject and safety lever. the ones that came with the pistol were uncomfortable. the ones i made are custom and fit much better in my hand. you may of noted the after market rear site. i wish it had the original. the bluing on the gun is original but in rather good shape. there are some scratches here and there from doing a field strip, and normal wear, but i guess that is a common. at some point i plan on going out and put a few rounds threw this thing. will let you all know how it goes..
i think next on my list is a Glock. i have been reading up on them and felt up a few of my friends.. ( i think a few of them would of preferred i felt up their GFs.. but im sure some of you may now how that goes... ) i will post that as well when i get it..
hmmm - what are your grips made out of and how much of a machine shop do you have? i might send you my lower to make me some decent grips for mine. the cheap plastic ones it comes with are, well, cheap. all i have are a couple of craftsman metal lathes.. one is a 40 something 6 x 12 but its on the shelf for now.. the other one is a 50 something ( i know i need to pin down the dates lol ) 6x18. need to replace the belt. a decent drill press and a basic garage, shop, work stuff. i want to get a mill machine. but they are around 700 for the small ones.. and then there is the tooling involved.. i think collecting guns is about the same in cost as trying to get a decent hobby maching shop up and going LOL. as to the grips. i think the wood is maple. part of the darker wood, as maple can be really streaky between dark and light wood. it was simply a piece of trim from a remodel i packed home and shove in the garage..then i applied jocobean stain. its a really dark stain and brought out the red in the wood.. after that i simply clear coated it with a acrylic Krylon clear coat.. semi gloss. it dries really fast and you can apply multiple coats fairly quickly. i have a bunch of oak. i thinking of making a nice display box for the pistol out of it. a friend of mine has some walnut he said i could have. i may try that.. he builds cannons and uses walnut mainly for the chassis. walnut is a very nice, dark hardwood. it can have some cool swirl patterns if you find the right piece. as to grips.. let me look around here and see if there isnt a pair of beat up used grips for sale.. if i can find some i can replicate them..or maybe ask around and see if anyone has some i can borrow. it seems there is a huge aftermarket for grips for the 1911.
everything you need to know about 1911 including blueprints to every single part including grips LOL. nice on your grips. remember my 1911 is not standard though. it is a RIA hi-cap. 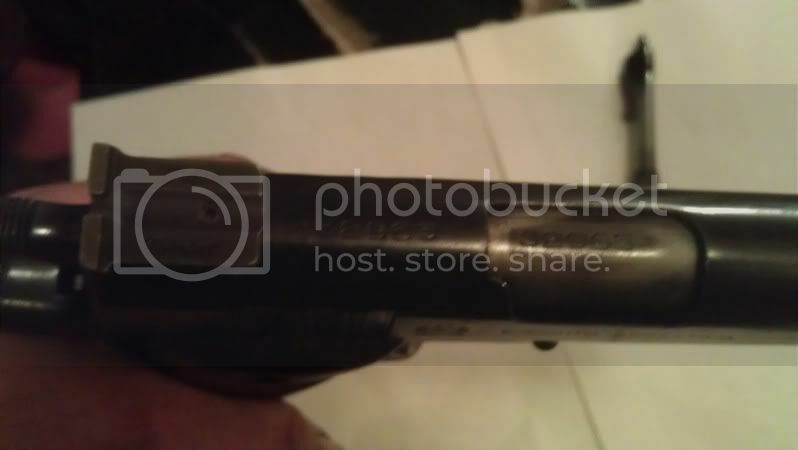 so the grips have this silly little tab that sticks out of the top rear. i will see if i can get some pics up. 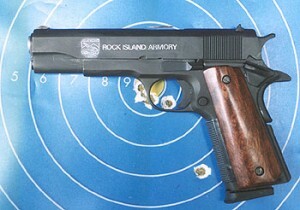 i know im new to all this, but i have heard a lot of great things about Rock Island Armory weapons. you will have to let me know how it goes once you use it some. from what i can see from web searches. a lot of RIA 1911 seems to sport regular pistol grips. such as this one. i will keep looking though. 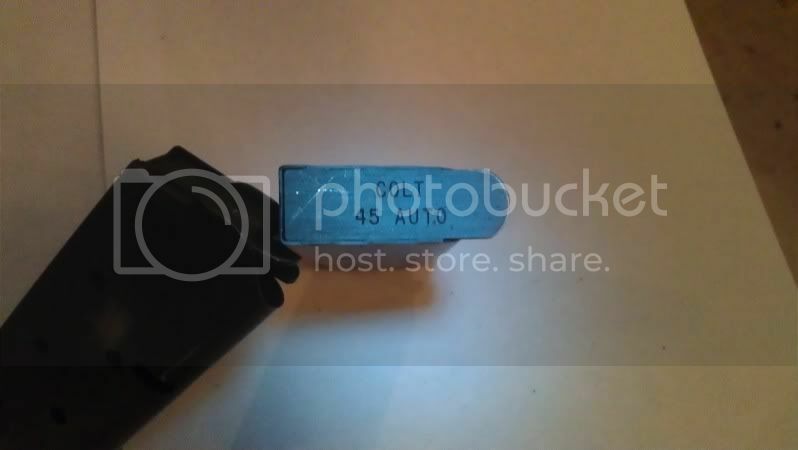 ( ok edited... is this the plastic tab your talking about? the last time i shot a pistol. i was about 15 and it was a 44 mag. TulAmmo manufacturer: OJSC "the Tula cartridge works" .45 auto 230 Gr. FMJ Steel case, non corosive, Boxed primed. for a box of 50 rounds, it cost me about 15 bucks. The reason i did this, is because i wanted to test this gun out. i wanted to see if the "cheap" ammo would cause FTEs or FTLs.. after some research on this pistol i did find mention that some ammos would cause problems. i havnt tried hollow points yet. so i may have problems with them. but i think i at least i found some inexpensive "plinker" ammo. the first 2 clips i used on some soda cans that were there. around 10 yards away. putting the first clip in my slide closed on its own. after looking back. i may have not had the slide locked all the way. i am at this point, chalking it up to user error. the third clip. i passed off what i figured to be 25 yards. 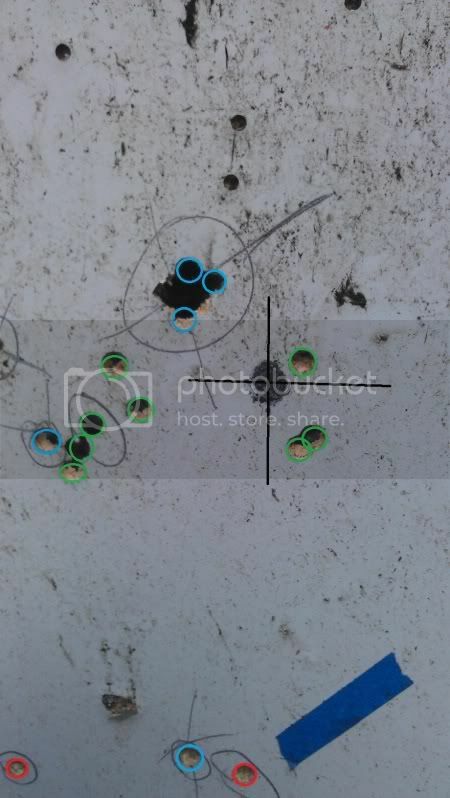 ( probably closer to 20 ) and shot at a cross hair and red circle drawn onto a piece of 8x11 piece of paper. i hit one shot about 2 inches above the red dot. the other 6? about 11 inches to the left, both above and below the horizontal cross hair line by about 6 inches each way..
after this i decided to get a bit closer. breaking out my tape. i measured off 45 feet. 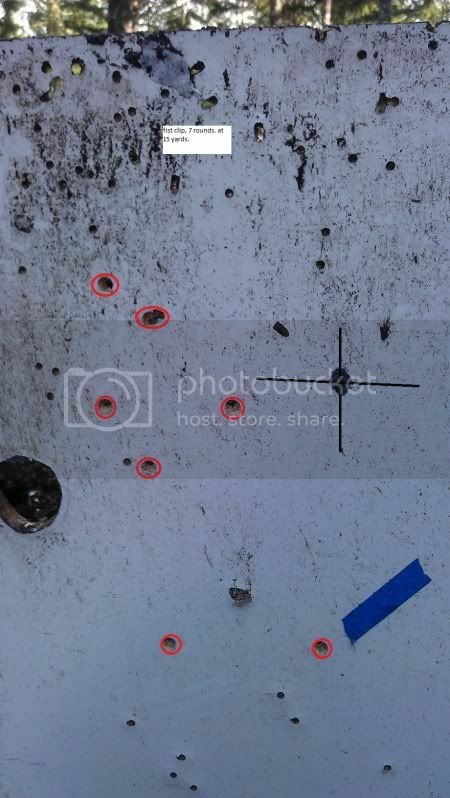 ( 15 yrds) and shot this group on a peice of particle board that was there..
ok... again to the left.. hmm. so i did a slight adjustment to the rear site. and then went and shot my 5th clip. a little better? maybe.. so i did a bit more aggressive adjustment. and on the 6th clip did this grouping. 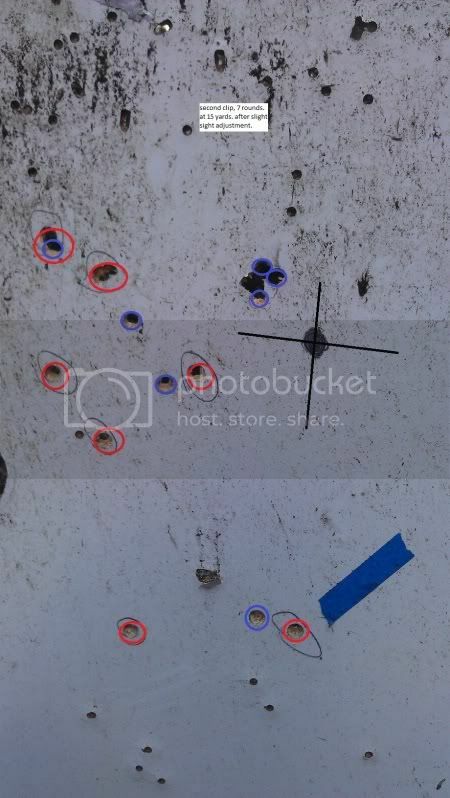 now i know little about what is good or not for groupings with pistols at different ranges.. if anyone has a clue. i would appreciate any comments. now this is where im at.. after talking to a friend who has some combat training. he said we should both go out and shoot. and see if it was me that was pulling it to the left. or the pistol its self.. if you look at the rear site on the pistol, you will notice the rear site looks like it is really far to the right. i guess in the end. i will be able to tell once i fire another pistol. if it pulls to the left. then i need to readjust my hold. will let you all know. yeah - that is it. the first one is probably a regular 1911, not hi-cap. the tab does not wrap arounf the back of the grip, just juts of of the back of the grip a bit, and is a bit hollowed out from the inside to allow either the trigger mechanism or mag eject mecahnism to work - i forget. RIA's are not bad. i have a friend that has one asa well, regular capacity. my training class this saturday did not pan out - the instructor had a family emergency. so it is next saturday. basic carbine class. i probably do not need it, my wife and a freind are going - more for them than me, but it has been a while and a refresher and introduction to civilian ranges will be good. we will do some rifle to pistol transition so i should get to fire both. we have the desert and mountains here. watch out for people though. many of them are very opinionated about things when it comes to guns, ammo, shooting, etc. and they can steer you wrong. that is especially true about brands/manufacturers of weapons. being that i have a .45 pistol. im looking for a 9mm. i have been eyeballing these. my buddy got one for 250 used! UHG dont know how he does it. he is always falling into deals right and left. a guy was selling 3 pistols. not sure what the other 2 where.. a friend of his got the other one and then someone bought the .22 cal for 100. the guy was selling all 3 for 600.
the boys and i went out shooting today. i wanted to show them some riffle safty and just create some good memories sort of thing we had fun. the riffle shot well. although i only have 1 10 round mag for it. i also shot my .45 again today. still pulling my shots to the left. same yardage as before. this is the second time the rear sight came loose again. i would locktite the screw. but im not sure if the aiming issue is pistol. or the operator lol. look an M&P Pro for 9MM. or a 1911 style in 9mm is not a bad way to go either. we did get my wife a Ruger SR9C. she likes it, and it is a good looking pistol. yea that does look like a sweet little pistol. the 22 was a blast.. should of seen the boys faces when i showed them! they thought it was a m16.. i had a to laugh.. what it is.. is a .22 cal pig with lipstick. the sites were 'ok' but, im puting a feaking scope on it. i picked up a used bushnell 3-9 today for 25 bucks used. painted it dark cammo green. but i have a plan as to why. will post pictures when im done. its just a fun cheap gun to mess around with. when i get my chosen 9mm. im almost thinking about this, because how inexpensive it is..
(damn what a long link... ) the only downside ( besides being 9mm cal. ) is that it only comes in 10 round mags. but, ive seen video of people using 30 round mags on it.. so have to do some research..
hopefully you are not a spammer, if so i will Ban you and your ip and report you. But seeing as you are in the Phillipines maybe it was the Rock Island Armory pistol talk that brought you here. BTW, BH, I had some work done on my Rock. It is now dual caliber capable, 9mm and .45. I bought two new slides, had adjustable rear and front tritium sights installed in each, ambidextrous safety, Commander hammer, and an extended beavertail installed. i will soon (i hope) strip everything down and cerakote it. damn that sounds awesome. im just curious, are you left handed? thats one downfall for the old ballester molina is you cant get the conversion kits. might use some of the same parts but the slide stops are cut different and i think some rail cuts are a little different..
i wish i would of worked the whole year!! UHG there is a local group on my Facebook, BigBoyToys BBT. of local people in Oregon selling weapon related items. one guy has a charles daly 1911 full size for $400.00 and another guy has a RI compact 1911 for 450.
when you get done post a pic.